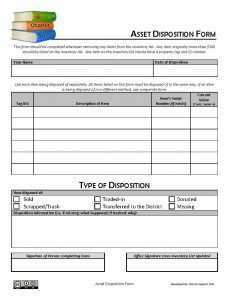 This form is a sample form to document when a school disposes of an asset at the school due to the item being old or no longer of use. 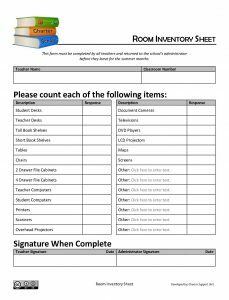 This form can be of assistance with auditing to show when materials are taken off of the school’s inventory. 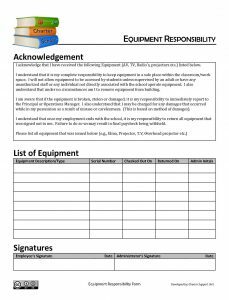 This is a sample form the school may wish to use when issuing expensive equipment to individual staff members, such as a laptop computer, to ensure employees understand the responsibility for caring for such equipment. 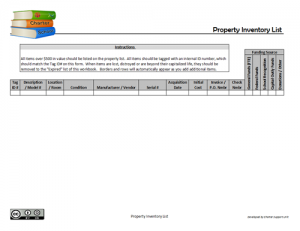 This sample form can be used for teachers to complete an inventory listing of the materials contained within their room. This is most often done at either the very start or very end of the school year.